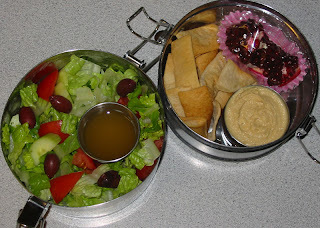 My lunches were either boring or repeats most of this week, so I didn't take any pictures until today: green salad with tomatoes, cucumbers, kalamata olives and olive oil-vinegar dressing, hummus, pita chips, and a wedge of pomegranate. The shmoo and I like sharing a pomegranate when they're in season. We lay out plastic on the table and load up on kitchen towels, then tear into the beautiful fruit and eat the jewel-like seeds one by one. 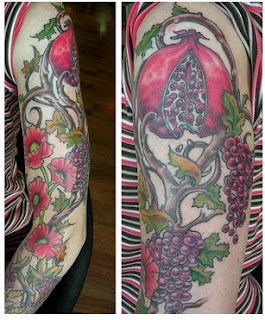 Pomegranates are super-healthy and oh, so pretty, but I'm especially drawn to them for their spiritual symbolism. Persephone ate a pomegranate seed in the Underworld and was condemned to stay four months in the Underworld every year. During these months her mother Demeter mourns for her and causes cold winter to cover the land. Pomegranates figure also in some Christian and Jewish traditions. Why, I even have one tattooed on my shoulder! After dinner last night I sliced a carnival squash into wedges and steam-baked it in the oven (fill the bottom of the baking dish with water, cover with foil, and bake until the squash tender, about 30 minutes). I let it cool slightly, then put it away in the refrigerator. In the morning it only took a few moments to make a pretty squash arrangement in my To Go Ware container. I like plain squash and find it pleasantly sweet, but you could bake it with margarine and maple syrup and sprinkle with salt if you like. In the middle of my squash is a smaller container of Lemon Rice and Peas, left over from earlier this week. 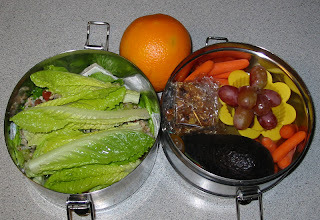 I also packed a salad with Russian dressing, a pear, and two Fruit & Nut Bars. The bars make a perfect snack late in the afternoon. My first week of work is over! I actually enjoy being back in an office environment, but I miss being able to shop and do errands during the day while everyone else is at work. I'm actually going to have to shop with the crowds this weekend -- shmoo and I will be getting ready for Christmas! ...how do I know? Because her curry tells me so! My mom has been watching the shmoo for me in the afternoons when he gets home from school. Last night when I went to pick him up Mom insisted I take home a big bowl of yummy cauliflower, potato, and chickpea curry she had just made. It was nice not having to fix dinner! I made sure to save enough to pack for lunch today. On the side are grapes and mandarin slices and celery with peanut butter. I didn't pack as much today. I've been so worried about going hungry I've been packing more than I can eat; one night I was too full to eat dinner when I got home! Today I scaled back and packed just enough. Today I made Lemon Rice and Peas from May All Be Fed. Last night I had leftover cooked brown rice, so it only took a few minutes to toss it together with Indian spices, frozen peas, cashews, low-sodium tamari and fresh lemon juice. I also threw in some garbanzo beans I had in the fridge. This morning I packed the cold rice and peas in my To Go Ware alongside an avocado wrapped in yellow Hello Kitty. I opened the avocado at lunchtime and mashed it with some balsamic vinegar for green salad. On the side are an orange, a low-sodium V8 juice, and yet more Fruit & Nut Bars (in case I needed a snack later in the day). Since I have access to a microwave, I transferred the rice and peas to a regular bowl and microwaved them at lunchtime. They were so good I didn't want to stop eating, but it was too much to finish! Today was my first 9 hour day, so I had to pack enough to get me through! I packed the last of my Thanksgiving Cabbage Rolls in a wide-mouthed insulated container that kept them nicely warm until lunchtime. 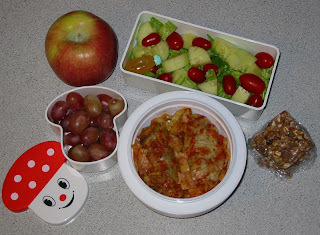 A simple salad with dressing is up above, with an apple, grapes in a smiling mushroom, and more Fruit & Nut Bars. It worked! I ate lots of fruits and veggies and still stayed nice and full until quitting time! I'm going to bed now. Today I started a brand new full-time job! That's right, I finally get to pack lunches for myself! Lunch Number One: an avocado with a tiny container of dressing, baby carrots, grapes, Fruit & Nut Bars, and four incredible lettuce wraps. 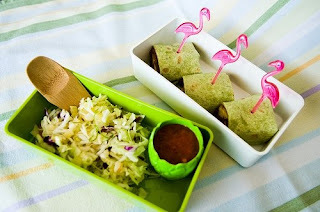 When Gluten Free Gidget shared her Buckwheat Tabbouleh Hummus Wraps on the This Is Why You're Thin! blog, I immediately thought of how lovely they would be as a healthy, gluten-free packed lunch. I followed her recipe but used only a scant 1/4 cup olive oil and less than half the salt -- it was spectacular! Very satisfying yet light and refreshing. I topped the wraps with extra romaine to munch on. I hope everyone had a great Thanksgiving! There is so much to be thankful for, especially our good health and the health and well-being of those around us. 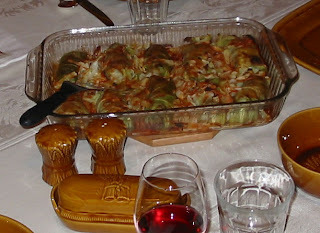 With that in mind, this year I again made my Cabbage Rolls as a healthy vegan centerpiece dish. The rolls are filled with a mixture of walnuts, brown rice, and garbanzo beans seasoned with herbs and Dijon and baked in a mixture of low-sodium veggie juice and lemon juice. They were a big hit -- even some of the meat-eaters gave them a try and liked them! 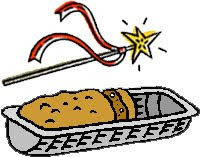 As an early Christmas present to all of you I am posting the recipe here. Use it next time you want to stay vegan and healthy at a festive feast. I'm sorry I didn't get this up before Thanksgiving, but I know there a few more opportunities coming up this season! The Loaf is Back, Baby! Quite a few of you have noticed that my Magical Loaf Studio has been down all summer. Good news finally! I moved my website to a new hosting service, got a little technical help (thank you, Greg), and the studio is up and running again! For those of you who haven't used it yet, the idea is to create your very own recipe for a vegan dinner loaf by choosing from the lists of options. For example, make a yummy loaf of lentils, amaranth, and almonds ... or garbanzo beans, oats, and cashews ... or black beans, rice, and pine nuts ... or kasha, butter beans, and walnuts ... etc. etc.! So if you're not sure what's for dinner, head on over to the Magical Loaf Studio and let your imagination run wild! Here it is, the final photograph from my new book! 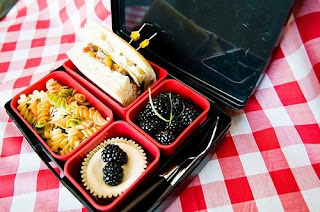 This was the Big Bento Box Photo Shoot, an epic day of cooking, set-up, and photography. I wanted to show every bento box menu I made for the Japan section of Around the World;I've been so inspired by Japanese bento culture, I couldn't leave anything out, and I also included lots of tips on how to make your own bento-style vegan lunch boxes. Okay, let's start with the red Laptop Lunch Box: Zaru Soba (cold noodles with dipping broth) with Carrot and Daikon Salad, edamame, and persimmon. In the pink bento box: Tofu Tamagoyaki with Potato Salad Balls, Octo-Celery (instead of the ubiquitous octodog, because vegan hot dogs won't curl, and celery is healthier anyway), Cucumber Sushi Rolls, cherry tomatoes, a Botan Rice Candy, and kiwi and watermelon stars. In the small red bento with red apple side dish: Onigiri (rice formed into shapes by hand or with a mold), vegan chicken nuggets, Stir-Fried Arame with Carrots and Ginger (this is one of my favorite dishes from the entire book, btw - sooo good!! ), Radish Rosettes, and Apple Bunnies. Finally, in the two-tier kitty bento: Tofu Tiger on a bed of rice, Carrot-Cucumber Tulips, Broccoli Salad with Daikon Flowers, and some strawberries. 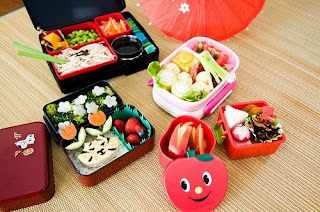 Except for the Laptop Lunch Box and the apple all these bento boxes were from I Love Obento! 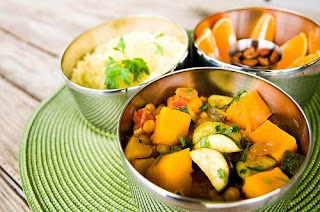 Link: Vegan Lunch Box Around the World. Here's another picture that didn't make it into the book, but I'll show it to you here! 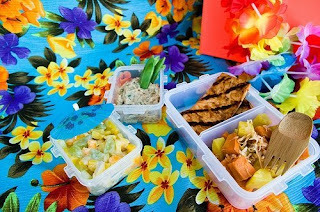 This is my Hawaiian Luau Lunch Box: (starting far left) Tropical Fruit Salad (mixed tropical fruit with coconut cream), Maui Onion Dip with sugar snap peas, Huli-Huli Tofu (grilled tofu with a Hawaiian-style barbecue sauce, and Aloha Sweet Potatoes (roasted sweet potato and yam topped with yummy toasted coconut). Okay, so maybe the fabric is a bit busy, but I still had a lot of fun making and setting up this lunch box! You can have fun when you make it, too, by including a paper umbrella to garnish the fruit salad or wrapping your lunch box in a plastic lei. Speaking of lunch boxes, this is another Lunchsense, size medium. The website says that this is the most popular size for grade school kids, and if you get it in this bright construction-worker orange, I'm sure your kids will never lose it! Indonesia -- land of tempeh! For those of you not familiar, tempeh is made by cooking and fermenting whole soybeans until they form a solid cake that can be sliced and steamed or fried; it has a nutty, mushroomy flavor and a firm texture. Nutritionally, tempeh has more bioavailable protein than tofu or plain cooked soybeans, and the fermentation process makes it easier to digest. So thank you, Indonesia, for inventing my favorite soy food and a vegan protein powerhouse! 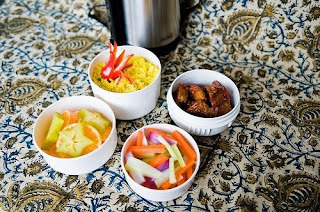 The vegetable pickles include lots of shallots, a member of the onion family which might not be familiar to all of us here in the West but is used extensively in Indonesia. Oh, I can't look at this picture without wanting to make and eat this all again! This is the menu for Morocco: Moroccan Tagine, Orange Couscous, tangerines (named after the city of Tangier, in Morocco! ), and Cinnamon-Sugar Almonds. Tagine is a thick Moroccan stew made with chickpeas, vegetables (tomatoes, zucchini, butternut squash, and peppers), raisins and spices, served on a fluffy bed of couscous. Couscous looks like a grain but is actually a tiny semolina pasta; it is a staple food in the cultural area of North Africa known as the Maghreb (west), which includes Morocco, Algeria, Libya, and Tunisia. So there you go -- your geography lesson for the day! The toasty, sugared almonds are actually even better using whole blanched almonds (almonds without their skins), but I wasn't able to locate any locally for the photo shoot. Here's another "Around the World" menu inspired by the cuisine of Italy: Grilled Vegetable Stromboli, Balsamic Strawberries, and a green salad with Italian dressing. Stromboli is usually made by rolling meats and cheeses up into an Italian bread dough before it's baked. After the loaf is cooked and cooled it's cut into slices and served. You can easily make stromboli with vegan meats and cheeses, but I decided to switch things up and use an assortment of grilled vegetables and a layer of roasted garlic instead. 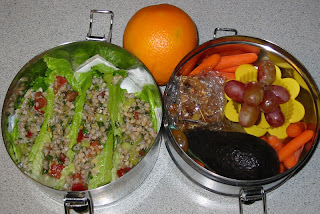 This lunch was photographed in a Lunchsense lunch box. The owner was kind enough to send me a Lunchsense to photograph for my book, and everyone who saw it was impressed. 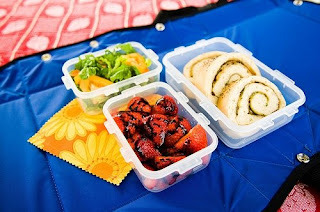 The containers have tight lids and fit together perfectly along with an ice pack and beverage container in the lunch box, which has a nice shoulder strap and also folds out to make a place mat for your meal. It's a great design, especially if your kids are old enough not to lose track of their containers and lids. This lunch showcases some of the traditional foods of the southwestern region of the United States, which includes Arizona, New Mexico, Utah, and Colorado: Corncob Cornbread, Anasazi Beans with roasted chiles, Prickly Pear Pudding, Fried Nopales, and a Baby Squash Medley topped with sunflower and pumpkin seeds. Just for fun I used scissors to cut corn tortillas into "cornhusk" shapes and wrapped them around the cornbread to resemble fresh ears of corn. The tortilla strips are used for scooping up bites of beans and nopales at lunch time. One cactus is in this lunch, served two ways: First, nopales are the flat, green pads of the prickly pear cactus. When cooked they taste something like lemony green beans, with a slippery quality like okra. They're very popular at the Hispanic grocery store in my town, where I usually have to stand in line to get to them, in bags already deprickled and diced. (I cut a whole pad into a little garnish, too.) Next, the red fruit of the prickly pear cactus is made into a sweet syrup that flavors the nondairy pudding for dessert. 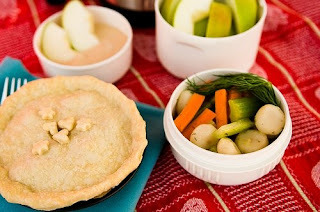 My menu for Nebraska features Chik'n Pot Pies filled with chicken-style seitan, mixed vegetables, and creamy gravy. Why Nebraska, you ask? Because the chicken pot pie was the first mass-marketed frozen pot pie, developed in 1951 by Swanson company in Omaha, Nebraska! So there! 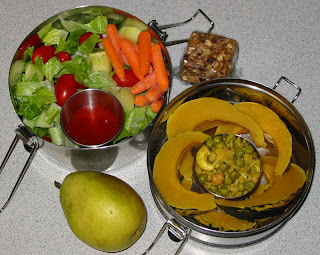 This lunch also includes Sticks-and-Stones Salad (carrot and celery sticks and water chestnut "stones"), and Apples with Caramel Dip. The caramel dip is amazingly quick and easy to make; I paired it with tart Granny Smith apples but it's also wonderful with bananas. 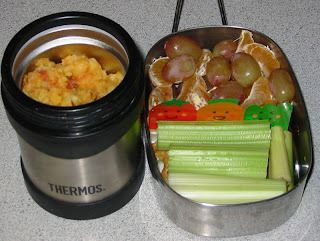 This meal was photographed, by the way, in a Mr. Bento style lunch jar with separate containers that stack together inside an insulated outer shell. 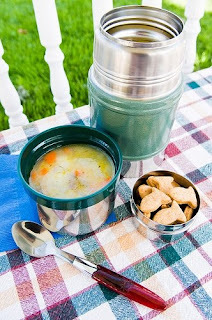 These are spendy but they're a nifty lunch container for those who want individual servings of different foods to all stay hot or cold together and stay upright like a thermos. A while ago I wrote about Kids Konserve, a company specializing in eco-friendly lunch sacks and containers for kids. ... and a non-toxic, biodegradable ice pack! "Should the ice pak puncture," the website says, "simply plant in your backyard!" They also wanted to offer you, my lucky readers, a discount coupon. 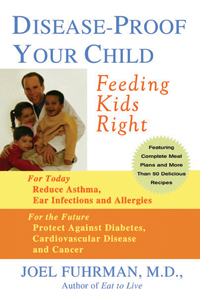 Save 15% off at Kids Konserve by using coupon code: vegan (valid until 9/30/09). I love this picture we took for one of my Caribbean lunch menus. Oh yeah, pink flamingo food picks with googly eyes, baby! Here's the menu, inspired by the island cuisine: Plantain Wrap with Tangy Black Bean Spread, salsa for dipping, and an easy Caribbean Coleslaw with lime and pineapple. Fried ripe plantains are popular in the Caribbean. I was surprised at what a great sandwich filling they made! The slight sweetness of the plantain paired perfectly with the tangy mashed black beans and spicy salsa. If you're not familiar with them, plantains look like large bananas, but aren't as sweet and aren't eaten raw. For this recipe look for ripe yellow plantains with black spots. Use a paring knife to help peel them. I love Thai food so much, I couldn't settle on just one Thai menu for the new book! Pictured here are my two menus inspired by Thailand: (counter-clockwise from front left) Pad Thai with sliced Asian pear, Red Curry Vegetables, and Cucumber Salad; Lime and Thai Basil Salad, Thai Iced Tea, and Mango Noodles. Both of the main dishes are made with gluten-free rice noodles that have been cooked, drained and stir-fried. The Pad Thai is a quick and easy dish made with the help of a storebought mix. The Mango Noodles take a little more time but are one of my favorite dishes from the cookbook: noodles seasoned with soy sauce, lime juice, ginger, garlic, and sesame oil, fried tofu, sweet pepper strips, snow peas, baby corn, and fresh ripe mango. They have a wonderfully complex sweet-sour-savory taste. Traditional Korean meals feature a wide assortment of panchan, or side dishes, surrounding a main dish of rice or noodles. Diners choose from the many panchan, adding a bit of something spicy to one bite of rice, a bit of something crunchy to the next, and so on. 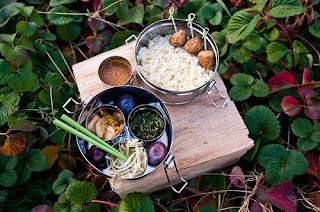 My Korean lunch box includes (in the bottom container) Beansprout Salad, kimchi, and Stir-Fried Watercress with three purple plums nestled in between; (top container) Korean Dipping Sauce with vegan meatballs on food picks ready for dipping, and a large helping of Rice with Toasted Millet. 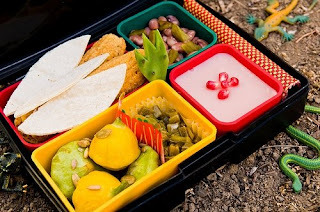 The lunch box you might recognize as a To-Go Ware tiffin and four Sidekicks. I love the way three Sidekicks fit together in the tiffin, making it perfect for panchan. By the way, this picture was taken in the middle of my strawberry patch! This is one of the first recipes I made for the new cookbook. 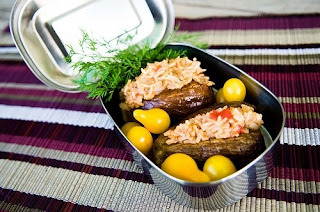 Last year around this same time I baked baby eggplants and filled them with lemony rice cooked with onions and tomatoes. This is part of my Turkish-inspired feast: Stuffed Eggplants, Fresh Fava Bean Salad, Mini Pita Bread, and a bite of Turkish Delight for dessert. In the photo I surrounded the stuffed eggplants with pretty yellow pear tomatoes and garnished them with fresh dill, all from the farmer's market. It's the time of year once again when the farmer's markets are awash with eggplants and tomatoes, so keep your eyes open for baby eggplants that are just the right size to fit into your lunch box! Those of you with Kindles might be interested to know that Vegan Lunch Box and Vegan Lunch Box Around the World are both available for Kindle! Do they make plastic covers for the Kindle so you don't splatter it with goo while you're cooking? I can imagine some lucky little Star Wars fans carrying these light saber chopsticks in their school lunch box. 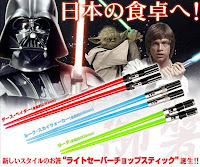 One of my favorite blogs, Tokyomango, reports, "Starting in November, you'll be able to buy these Star Wars light saber chopsticks in Darth Vader Red, Luke Skywalker Blue, or Yoda Green". Another photograph from the United States section of my new book, this one inspired by New England: New England Chowder and Fish Crackers. I love a warm bowl of chowder on a cold fall day, but I don't like the heaviness of most cream-based soups. I wanted my recipe to be healthy and light, so I made my version of chowder with corn cream: cook fresh or frozen corn kernels in water, then blend and strain. Stir into a soup made with carrots, celery, onions, potato, mushrooms, and seasonings (including lots of white pepper!). The Fish Crackers are a modified version of the Vegan Goldfish Crackers recipe I posted several years ago. The entire New England menu also includes Boston Brown Bread Muffins with vegan cream cheese and a pear for dessert. There's another new entry in the kid-friendly lunchbox market. This one's called the Goodbyn, and features built-in compartments with no lids or removable containers to keep track of, an 8-ounce bottle with its own compartment, built-in handle, and best of all, stickers. I think it's a bit goofy to look at, but still cute. From the photographs and description, it looks like it can hold quite a lot of food -- even a whole banana. Thoughts? This picture is so beautiful, with those gorgeous dark blackberries glistening like little jewels, I can't believe it didn't make it into the book! This is one of two Italian menus I wrote for the book: Caponata Sandwich, tri-color pasta spirals, Mini Vegan Cheesecakes, and blackberries. Caponata is a sweet-and-sour eggplant relish, wonderful here sandwiched between slices of crusty Italian bread with a slice of vegan mozzarella. These muffin-sized vegan cheesecakes are one of my favorite "decadent" recipes from the book. They were very simple to make, down to their graham-cracker crust, and were a big hit with everyone who tasted them, both vegan and non. I'm going to post pictures for the next few weeks to give everyone a taste of what the new book is like! 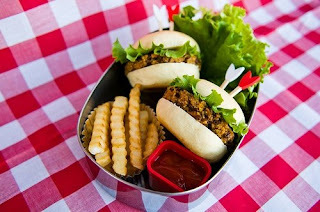 Here is the photo we took for Kansas: Mini Veggie Burgers with french fries and ketchup. This is my favorite picture from the book. The complete menu for the Kansas-inspired meal is: Mini Veggie Burgers on Mini Burger Buns, baked frozen french fries, Limeade Fruit Salad, and Oatmeal Cookies. The burgers are made from amaranth, lentils, carrots, and sunflower seeds, and are gluten- and soy-free. is a burger made of -- VEGGIES! Whew, I just spent most of the afternoon photographing and listing eight of my lunch boxes on ebay. 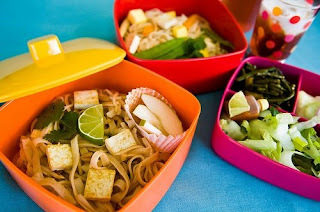 It's time to start thinking about what lunch container you're going to use for back-to-school! Most of these lunch boxes were used to take photographs for my cookbooks -- one is even the cover model for my first book! Some of these were only used once or twice, so they're in perfect condition. Most are plastic and bento-style lunch boxes, but one is stainless steel and one is a really cool insulated food carrier with four inner containers, like a "Mr. Bento". Oh, and one set is an accessory bundle: the purple Gel-Cool lunch container was small, so I bundled it with lots of lunch box accessories. They're all small and cute, perfect for a preschool or kindergartner: little forks, little dip and candy containers, pretty food picks, and a hand-sewn napkin. 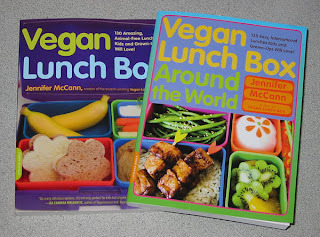 My new cookbook Vegan Lunch Box Around the World is coming out August 11th, just in time for school to start again! If you want your copy the minute it becomes available you can even preorder at Amazon. When the advance copy arrived I just had to take a pictures of my two books side-by-side; I love the way this cover complements the first one in a "collect-the-whole-series" kind of way. I've been looking through it and I have to say I'm delighted. I love the style, the photographs, and all the work everyone at the publishing company did to make the book pretty and easy to read. 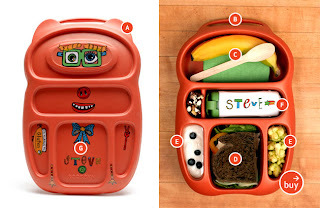 Even though I love love love Vegan Lunch Box, I actually think the new book is -- dare I say it? -- even better. The first book was written during my very first year of making lunches; this one was put together after many more years of experience. I think it reflects a growing aesthetic, a better understanding of menu planning and packing, and a more adventurous palate. I learned a lot writing this book. Like the title says, the lunch menus are inspired by cultures and cuisines from across the globe. I took the time to research the cuisine and culture of each area I touched on and have interspersed the menus with tidbits of information about the regions and what lunch is like for people in different parts of the world. 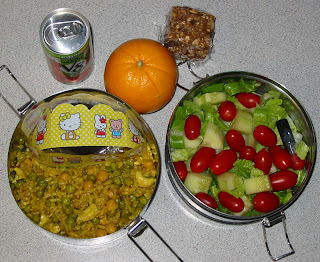 So if you're contemplating lunch time or shopping for back-to-school, keep Vegan Lunch Box Around the World in mind! You'll be eatin' pretty and helping the shmoo and I stay off the streets! !